The nearshore environment has its share of natural hazards. The following suggestions should help you avoid a number of them, and make your MLCD experience more enjoyable. Plan your trip well. Check local tide conditions, and know what the tide will be doing at your destination. Tide calendars, newspapers and the National Weather Service are all sources of tide information. It’s a good idea to check weather forecasts as well. Before getting into the water, or even walking around near the water’s edge, it’s a good idea to watch the waves for about fifteen minutes or so to get a feel for their action. Waves come in sets, and although they may be small when you arrive at a site, a big set may come in a few minutes later. Pay continuous attention to water conditions, since they can change rapidly. Waves generally tend to increase in size as the tide comes in. Increased surf will also cause currents to become stronger. These include longshore currents, which move water parallel to the shoreline, and rip currents, which carry water seaward. 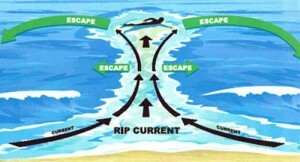 Rip currents are usually found in reef channel areas or near the centers of bays. 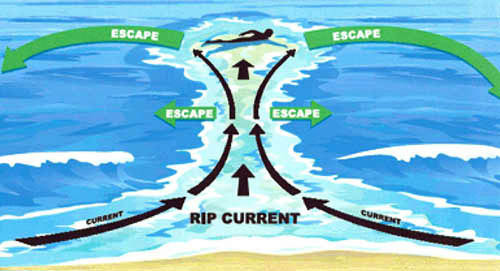 If you’re caught in a rip current, you’ll be carried seaward, probably until you’re outside the surf zone where the current will dissipate. Don’t try to swim against a rip current; you’ll only wear yourself out. Remain calm, and swim parallel to shore until you’re out of the rip. Whether diving, snorkeling or swimming, it’s best to be with a partner. Know your limitations, and don’t snorkel out farther than you could swim back without your snorkeling gear. Keep track of where you are relative to land and your exit point. To avoid sunburn, it’s a good idea to wear a shirt, especially if you’re snorkeling during the peak sun hours from about 10 am to 2 pm. When walking near tidepools or along rocky shorelines, be sure to wear the right kind of footwear. Slippers are not acceptable, since they’ll come off too easily. Wear tabis or old sneakers, which provide good protection and fit tightly. If walking on rocks near the water’s edge, look for wet areas which indicate where waves are splashing on the rocks. If you walk around on these areas, chances are you’ll get splashed, too. The wave’s force could knock you down on the rocks or into the water. Also look for wet areas of freshwater runoff, which look like little streams on the rocks. Algae often grow in these spots, causing them to be extremely slippery. Most animals and some plants have natural defenses, and they’ll probably try to defend themselves against you. If you’re not sure what an animal is or what it might do to you, it’s best to just leave it alone. Never do anything to provoke fish, especially eels. Don’t poke your fingers or hands into crevices or holes, since you never know what might be inside. Be careful where you step and what you grab with your hands. Animals that can puncture or sting are very common on the reef. 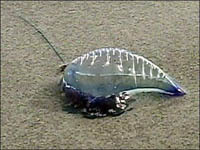 Portuguese Man-O-War are often found on beaches and in the water where on-shore winds are blowing. The purple float enables the wind to move the Man-O-War around the water, and the tentacles contain numerous stinging cells. Even when washed up on the beach, the tentacles will continue to sting, and popping the float won’t kill the stinging cells. Severe reactions to the sting can include irregular breathing and heartbeat. Coral has sharp edges which can cause abrasions, irritation, torn skin and possibly infections. Contrary to popular belief, coral will not continue to grow inside a cut. If you suffer coral cuts, clean the cuts with rubbing alcohol, hydrogen peroxide or soap and water, then apply an antiseptic. If the cut is deep, consult a physician. Mild abrasions can be treated by soaking the irritated areas in a dilute vinegar solution. 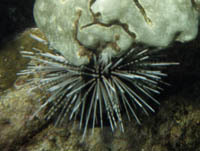 Sea urchins (wana) have long brittle spines, some of which may be venomous on certain species. A puncture wound will result in throbbing pain and possible infection. If poked by a sea urchin, soak the wound in hot water until the pain goes away, then apply undiluted vinegar. See a physician for removal of long embedded spines. 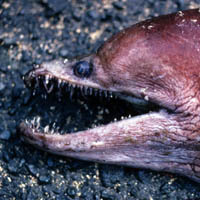 Moray eels generally look more intimidating than they are, but when provoked can cause considerable damage with their sharp teeth. Avoid trying to feed eels under any circumstances. If bitten, clean the wound with soap and water and apply antiseptic. If the wound is serious, apply pressure and elevate to control bleeding, then get medical help as soon as possible. More information on dangerous marine organisms is available in various local publications. The information presented here is based on the University of Hawaii Sea Grant Advisory Report UNIHI-SEA-GRANT-AR-78-01, July 1978, University of Hawaii Sea Grant College Program. Copies of the report are available from the publisher on request. The author and publisher specifically disclaim any liability, loss, or risk incurred as a result of the use and application, either directly or indirectly, of any advice and information presented here.